Amazon Price: $176.00 $144.00 You save: $32.00 (18%). (as of September 22, 2017 1:33 am - Details). Product prices and availability are accurate as of the date/time indicated and are subject to change. Any price and availability information displayed on the Amazon site at the time of purchase will apply to the purchase of this product. 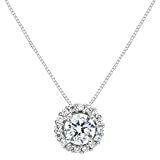 Gorgeous pendant featuring a brilliant round cut 6.5mm (1.0 carat) cubic zirconia stone, surrounded by 16 more 1.5mm CZs for a total diamond equivalent of 1.24 carats . Our top-grade AAAAA CZ look just like a real diamond that would cost thousands of dollars. This stunning 10mm long pendant is professionally set in a heavy basket setting and dangles from a 16 inch sturdy box link chain with a springring clasp. All are crafted from solid 14K white or yellow gold, with no other metals mixed (not plated or filled). This beautiful necklace is elegantly presented in a deluxe black velvet box.